Download "T3: A Classification Algorithm for Data Mining"
3 52 C. Tjortjis and J. Keane inability to cope with very large data sets [3, 8]; the lack of useful information derived when data sets present complex interrelations, that cannot be fully described by a twolevel decision tree; and possible overfitting of the training set . T2 s behaviour for various data set sizes has been studied and the maximum depth of 2 restricts its efficiency when dealing with large sets. Hence, the approach here is to enhance T2 with the ability to build trees of depth up to 3. This enhancement is termed T3 and uses the same building tree approach. The cost of allowing T3 s trees to grow bigger, needs to be balanced by limiting the tree size to only that necessary. The approach taken introduces a new parameter called Maximum Acceptable Error (MAE). MAE is a positive real number less than 1, used as a stopping criterion during tree building. The idea is based on the observation that T2 uses a greedy tree building approach meaning that further splitting at a node would stop only if the records already classified in this node, belonged to a single class. However, this greedy approach is not optimal, as minimising the error in the leaf nodes does not necessarily result in minimising the overall error in the whole tree. In fact, it has been proved that a strategy choosing locally optimal splits necessarily produces sub-optimal trees . Furthermore, even minimising classification error does not always cause minimisation of the generalisation error, due to overfitting. By introducing MAE, the user can specify the level of purity in the leaves and stop further building of the tree, concerning a potential node split. MAE has been set to have 4 distinct values, namely 0.0, 0.1, 0.2 and 0.3, meaning that splitting at a node stops even if the error in that node is equal to or below a threshold of 0, 10, 20 or 30% respectively 2. 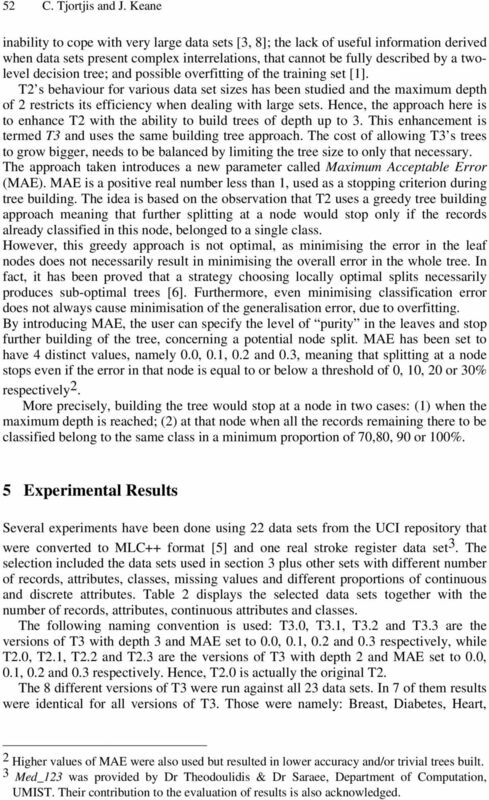 More precisely, building the tree would stop at a node in two cases: (1) when the maximum depth is reached; (2) at that node when all the records remaining there to be classified belong to the same class in a minimum proportion of 70,80, 90 or 100%. 5 Experimental Results Several experiments have been done using 22 data sets from the UCI repository that were converted to MLC++ format  and one real stroke register data set 3. The selection included the data sets used in section 3 plus other sets with different number of records, attributes, classes, missing values and different proportions of continuous and discrete attributes. Table 2 displays the selected data sets together with the number of records, attributes, continuous attributes and classes. The following naming convention is used: T3.0, T3.1, T3.2 and T3.3 are the versions of T3 with depth 3 and MAE set to 0.0, 0.1, 0.2 and 0.3 respectively, while T2.0, T2.1, T2.2 and T2.3 are the versions of T3 with depth 2 and MAE set to 0.0, 0.1, 0.2 and 0.3 respectively. Hence, T2.0 is actually the original T2. The 8 different versions of T3 were run against all 23 data sets. In 7 of them results were identical for all versions of T3. Those were namely: Breast, Diabetes, Heart, 2 Higher values of MAE were also used but resulted in lower accuracy and/or trivial trees built. 3 Med_123 was provided by Dr Theodoulidis & Dr Saraee, Department of Computation, UMIST. Their contribution to the evaluation of results is also acknowledged. 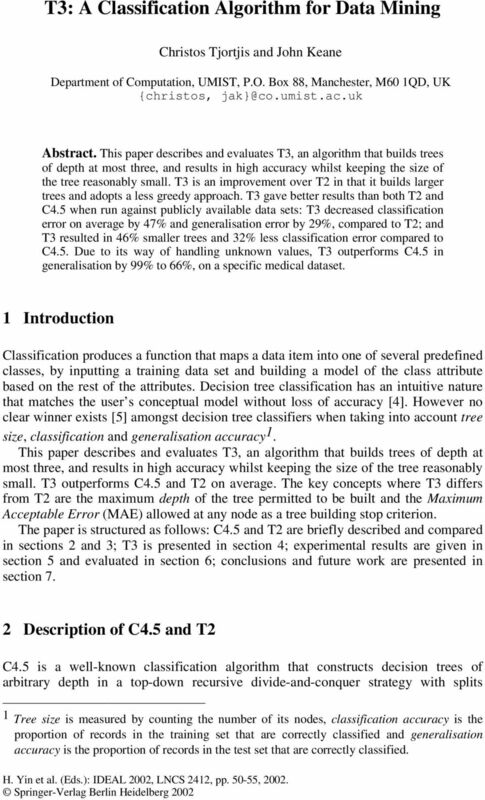 6 T3: A Classification Algorithm for Data Mining 55 capturing less useful information when used on data sets presenting complex interrelations that cannot be fully described by a two-level decision tree. Further work will address the way continuous attributes are treated, as the current algorithm does not improve on T2 in this respect. Scalability is another known weakness of T2 that has not been addressed yet by T3. 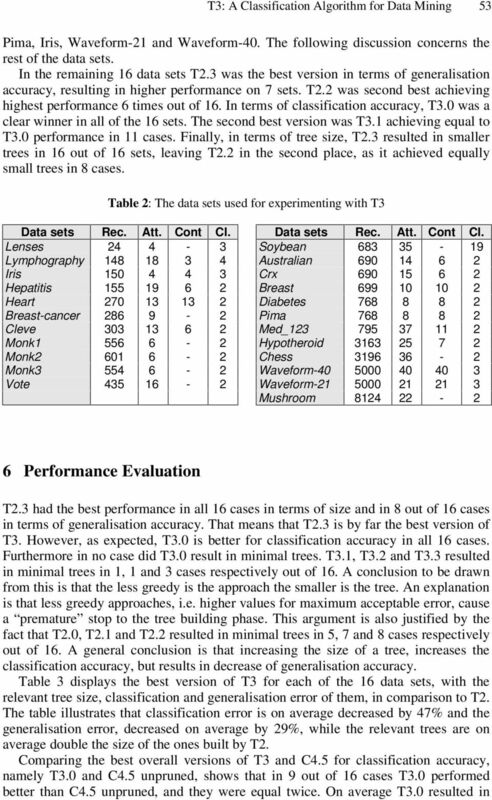 T3, as T2, seems to achieve better performance for small or medium size data sets. 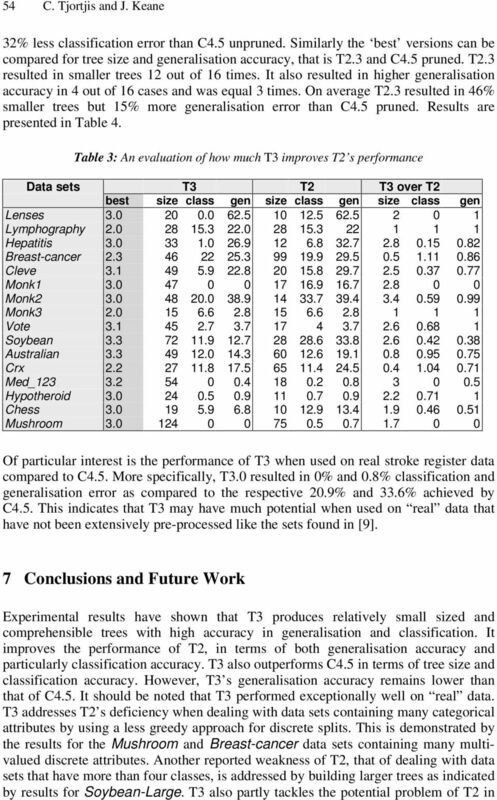 Table 4: A comparison between T3 and C4.5 Data set T2.3 C4.5 pr. T3.0 C4.5 unpr. size gen size gen size class size class Lenses Lymphography Hepatitis Breast-cancer Cleve Monk Monk Monk Vote Soybean-large Australian Crx Med_ Hypotheroid Chess Mushroom References 1. Aha, D.W., Breslow, L.A: Comparing Simplification Procedures for Decision Trees on an Economics Classification, NRL/FR/ , (Technical Report AIC ), May 11, Auer, P. Holte, R.C., Maass, W.: Theory and Applications of Agnostic PAC-Learning with Small Decision Trees, Proc. 12th Int l Machine Learning Conf. San Francisco, Morgan Kaufmann 1995, pp Breslow, L., Aha, D.W.: Comparing Tree-Simplification Procedures, Proc. 6 th Int l Workshop Artificial Intelligence and Statistics, Ft. Lauderdale, 1997, pp Ganti, V., Gehrke, J., Ramakrishnan, R.: Mining Very Large Databases, IEEE Computer, Special issue on Data Mining, August Kohavi, R., Sommerfield, D., Dougherty, J.: Data Mining using MLC++: A Machine Learning Library in C++, Tools with AI, Murthy, S., Saltzberg, S.: Decision Tree Induction: How effective is the Greedy Heuristic?, Proc. 1st Int'l Conf. 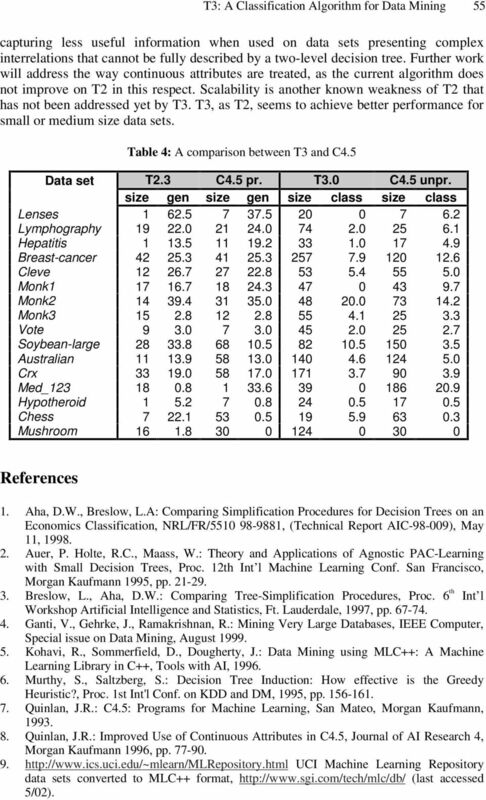 on KDD and DM, 1995, pp Quinlan, J.R.: C4.5: Programs for Machine Learning, San Mateo, Morgan Kaufmann, Quinlan, J.R.: Improved Use of Continuous Attributes in C4.5, Journal of AI Research 4, Morgan Kaufmann 1996, pp UCI Machine Learning Repository data sets converted to MLC++ format, (last accessed 5/02). Scaling Up the Accuracy of Naive-Bayes Classiers: a Decision-Tree Hybrid. Ron Kohavi. Silicon Graphics, Inc. 2011 N. Shoreline Blvd. ronnyk@sgi. Decision Trees. Andrew W. Moore Professor School of Computer Science Carnegie Mellon University. www.cs.cmu.edu/~awm awm@cs.cmu. Background knowledge-enrichment for bottom clauses improving.